The city of Jinzhou lies 20 kilometres inland 430 kilometres north of Beijing in the province of Liaoning. 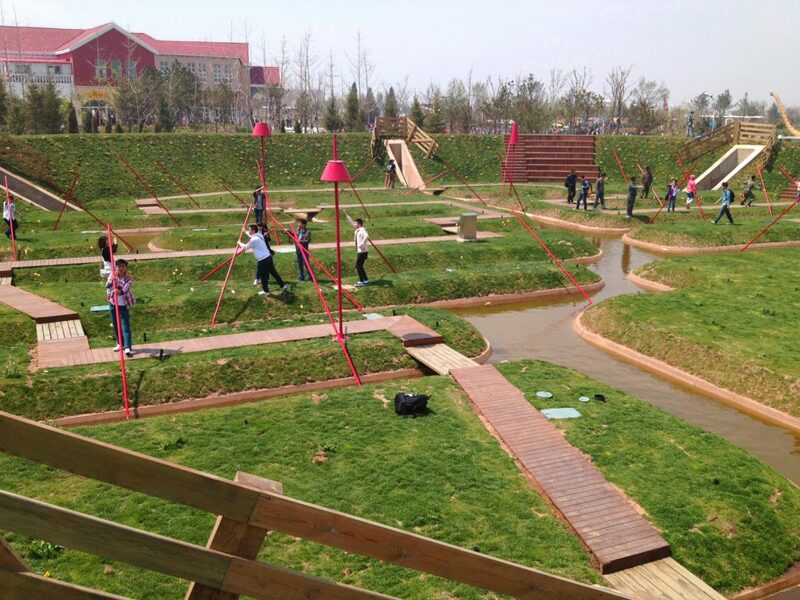 The Jinzhou Longqiwan New Area is an urban development on the coast of the Bonzai Sea. 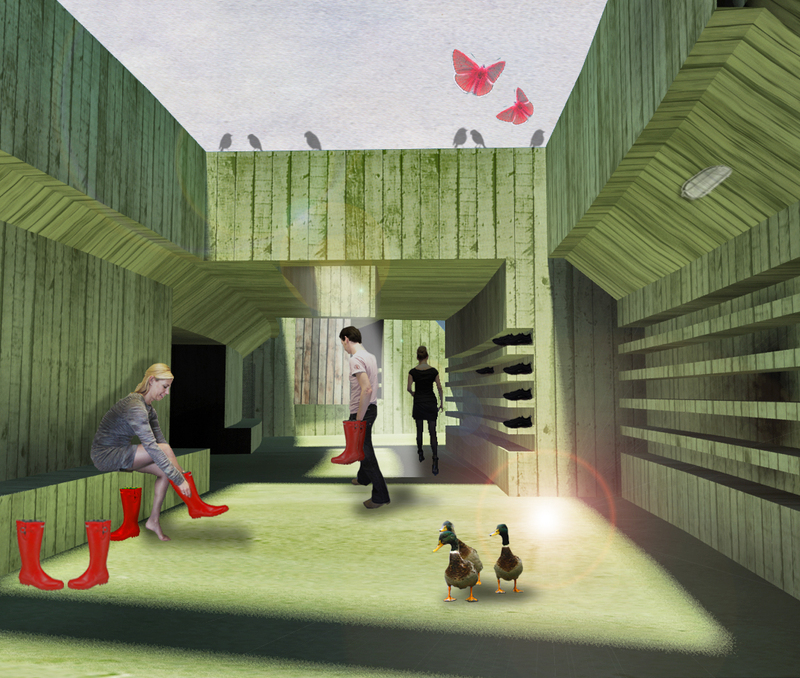 An element of this development is a park, for which Bureau B+B built a ‘fierljep’ polder and an information center. 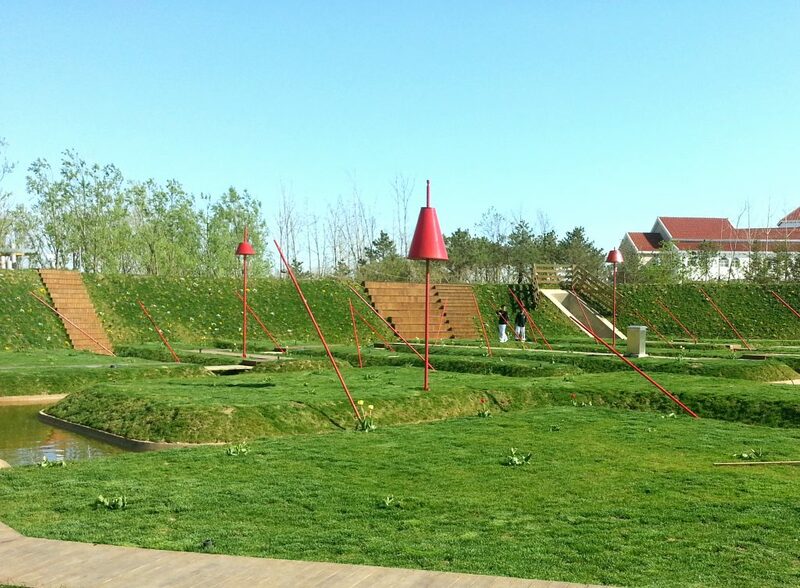 This polder-garden opened during the Jinzhou World Landscape Art Exposition in 2013. A meadow and system of ditches are protected by the a three-meter high dike that surrounds the garden. 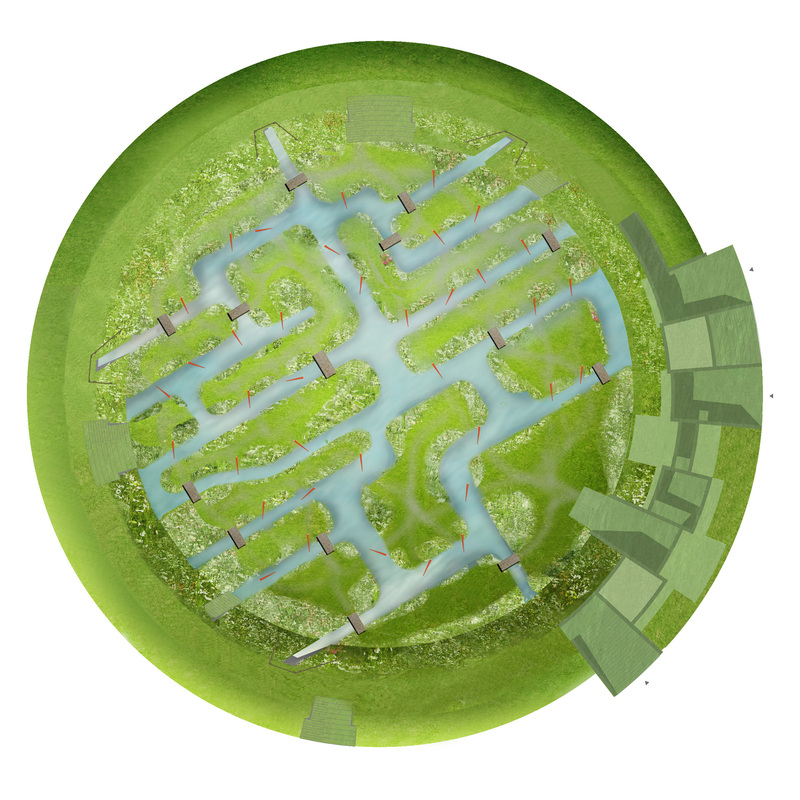 The polder is vacant, devoid of views and stands in sharp contrast to the other gardens. But before you know it, the polder becomes a playground. Visitors enter the polder through the information center. Once in the center, they swap their own shoes for rubber boots and an informative film explains how to ‘leap a ditch’. This concrete space, with its alcoves and peepholes, is located in the dike and refers to a fortification. 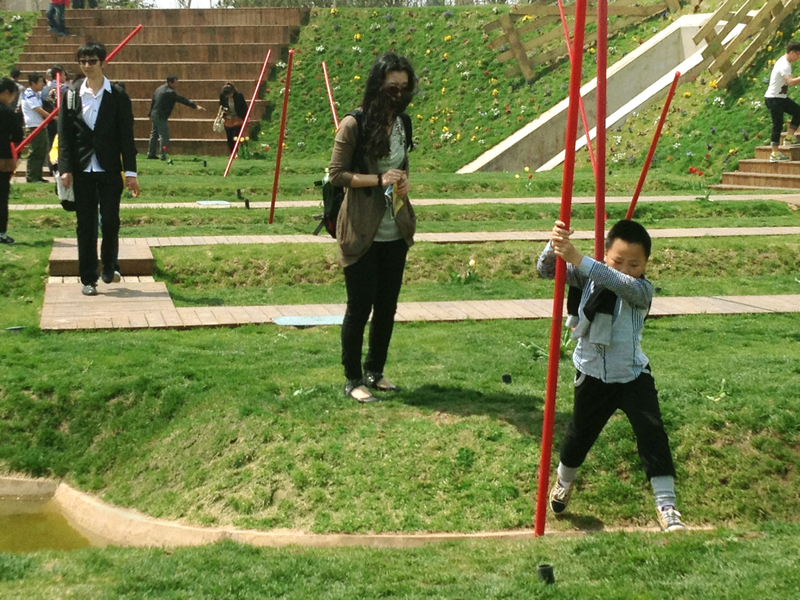 The green-impregnated concrete and caverns, which bring the sunlight into the space, offer visitors an adventure even before they enter the garden. Flower-filled fields of grass lie between the ditches. They differ in color due to the varied maintenance plan, visitor dynamics, and subtle differences in soil conditions and dampness. 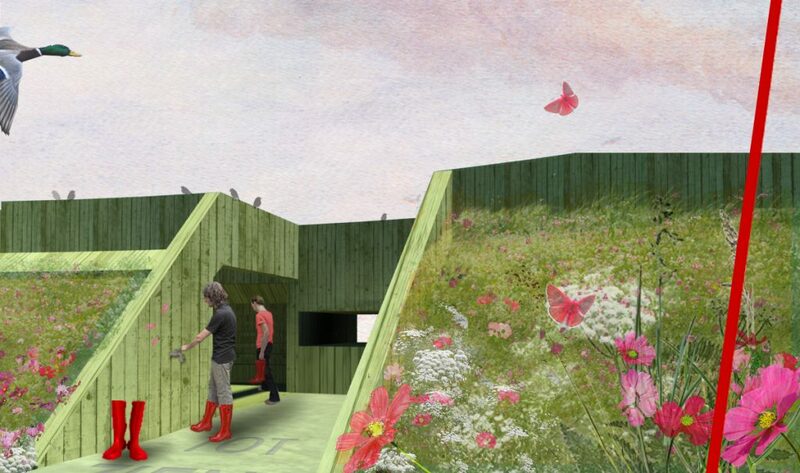 The result is a realm of meadow-islands with plants that can be tread on, plants for water and banks, clover and flowers in the grass, all of which changes during the exposition season. Picking flowers and lying in the grass is permitted. With a hand-made crown of flowers in your hand and splashes of water on your cheek, you say good-bye to the polder.